Bedroom 2: king-size bed, office desk, aircon, wardrobe. Bedroom 3: queen size bed, aircon, wardrobe. Fully equipped family house with large garden and office space. Paakok is located east from the Heroines Monument. 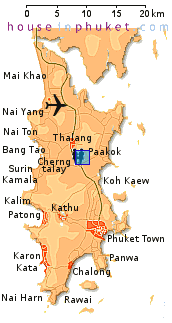 Good gateway to the airport and Bang Tao beach, Laguna, Cherntalay, Blue Canyon Golf course and Mai Khao (JW Marriott). Kitchen: gas cooker with hood, fridge/freezer, microwave, oven, dining table.